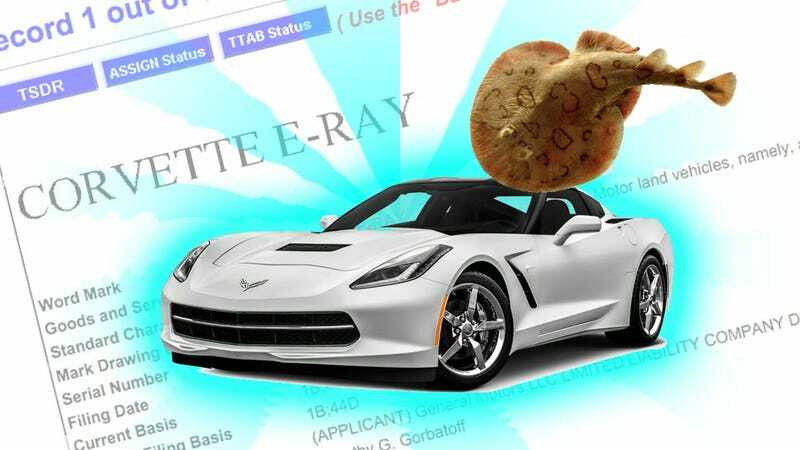 A curious spy photographer found something interesting while trolling the US Patent and Trademark office: a trademark, registered by GM, for the words “Corvette E-Ray.” What’s Chevrolet up to here? An electric ‘Vette-based concept car for the Detroit Auto Show? A hybrid Corvette? A mid-engined ‘Vette that runs on eggs? Chances are pretty damn good the ‘E’ in ‘E-Ray’ stands for ‘electricity,’ not eggs or eels or evangelism. A reworking of the current C7 to be a hybrid seems sort of improbable, as does a production, all-electric Corvette, at least right now. So, my guess is this will most likely turn up first as a concept, and perhaps eventually there will actually be a production Corvette E-Ray. Maybe it will be electric, maybe it will be a high-performance hybrid. Who knows? Nature has already provided a template, since an Electric Ray is already an existing animal; not some exotic concept animal you can only see at the Detroit Aquatic Animal Show, but an actual, available-now, ocean-dwelling Torpediniform. These things can discharge up to 220 volts! That’s enough for a European wall outlet! I guess that means I need a step-down transformer if I want to plug any of my stuff into one. Good to know.